Everyone probably has a place in the world they’d like to visit before their life journey ends. For me, that happened very recently when I traveled to Edinburgh, Scotland. While I was only on the ground there for a few days, I had the opportunity to get a glimpse of the Scottish culture, enjoy the warmth of the Scottish people, and spend time drinking my favorite beverage, single-malt Scotch Whiskey, in the land where it was born. There were two particularly enjoyable events I enjoyed that I’d like to share. 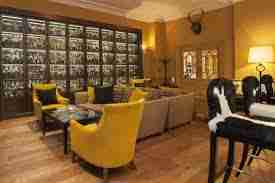 The first event was a tour at a place called The Scotch Whiskey Experience located just down the Royal Mile from Edinburgh Castle. You can read all about it here. While a bit “touristy” in its approach, this event featured a presentation highlighting the different regions in Scotland (Islay, Highland, Speyside and Lowland) as well as an explanation of the tasting notes of the whiskeys from each region. Accompanying the tasting note discussion was a card with scents embedded in it that captured the essence of the “nose” of the of the whiskeys for each region. For the Lowlands, the essence was lemon, emphasizing the lightness of the whiskey, an essence I’ve experienced with The Glenkinchie. For the Highlands the essence was vanilla, capturing the one of lead flavors of Highland malts like The Glenmorangie. For Speyside, the essence was orange, demonstrating the citrus nose of whiskeys like The Macallan. For Islay, the essence was smoke, capturing the nose of the many whiskeys from that island like Laphroaig. 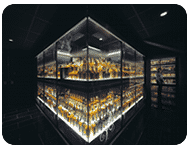 Probably the highlight of the tour was spending time in the room which houses the Diageo Claive Vidiz Collection of Scotch Whiskey, the largest collection in the world numbering over 3,500 bottles. 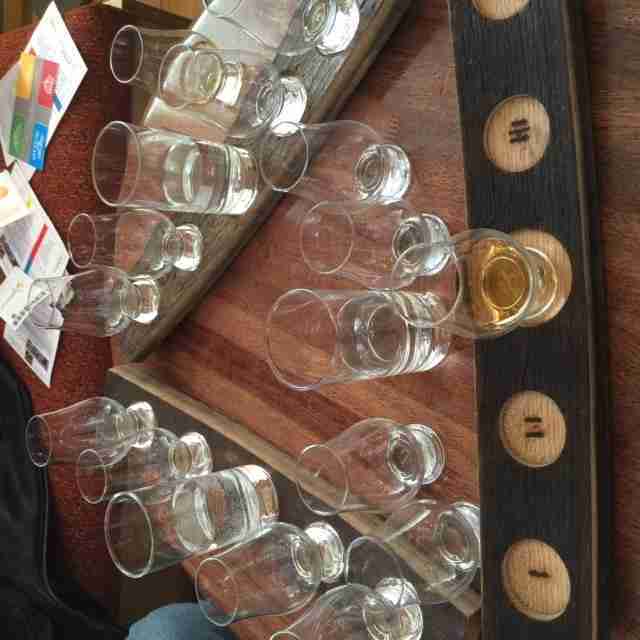 While the tour included a taste of one whiskey, for an extra 10 pounds, four additional tastes were provided. My companions and I chose this option of course. 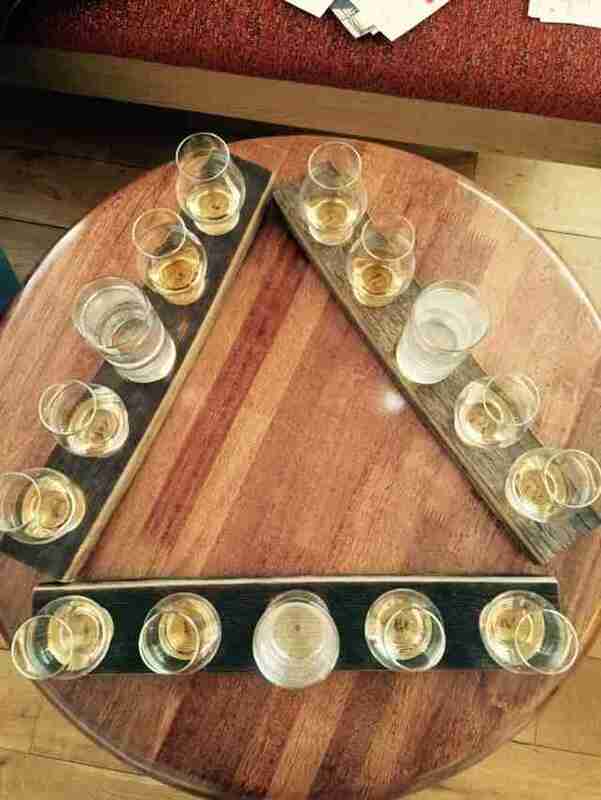 The four tastes were served on the stave of a whiskey barrel in classic Glen Cairn glasses with a large glass of water to cleanse the palate after each taste. The before and after pictures of that experience appear below. 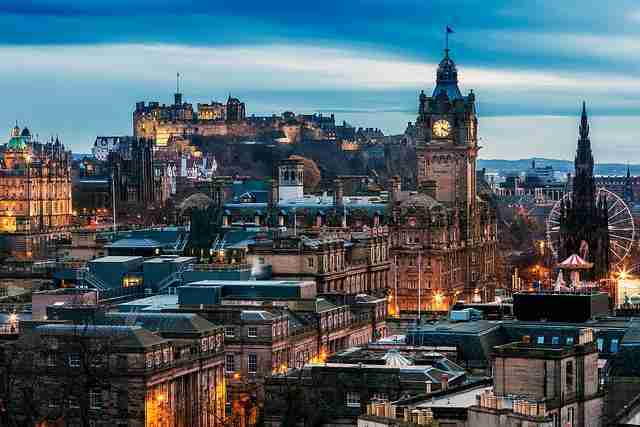 So after a nap and a meal to give our livers something else to work on, our second experience was an evening in Scotch, the Whiskey Bar at the Balmoral Hotel, an Edinburgh landmark, the tower of which appears in the foreground in the photo of the city above. 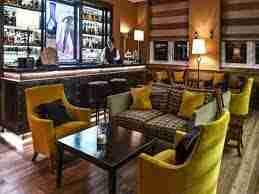 The bar, known throughout the city, houses a collection of over 460 single-malt whiskeys. Lyle, the very attentive bartender, talked us through tasting notes on four whiskeys and then a representative from Bacardi, owner of the Aberfeldy distillery, provided us with a glass of the 21-year-old Aberfeldy to cap off our evening. The Aberfeldy, a highland malt, was light, complex and slightly sweet. The nose was honey and fruit, the palate was smooth with vanilla and a surprising touch of smokiness and the finish was gently receding with notes of peach and honey. It was thoroughly enjoyable. Of course, in between our two events, we managed to find a liquor store that sold many brands of the amber nectar for prices that were 50-66% of what they sell for in the US, even with the exchange rate and value-added-tax thrown in. To say I stocked up would be putting it mildly. I can’t wait for my return to this land of beauty, friendship and amazing spirits. Maybe Colin Pearce will need to have an adventure set in Scotland. I’ll have to do some research there….